I Love the Kalamata Olive! I've always liked green olives..until I found the Kalamata Olive..these tasty little morsels go with most meals or are used in many dishes I make. After I read this article I found even more reasons to enjoy them..read what "The Alternative Daily" has to say about olives. Many people probably consider olives as vegetables that add a pinch of pizzaz to pizza, pasta, subs and sandwiches. However, the olive is actually classified as a fruit of the Olea europea tree. This impressive tree can live for hundreds of years (the world record goes to a particular carbon-dated tree believed to have lived for over 2,000 years) sprouting millions of these juicy orbs during its lifetime. There are hundreds of varieties of the Olea europea tree, each bearing its own unique version of the fruit. 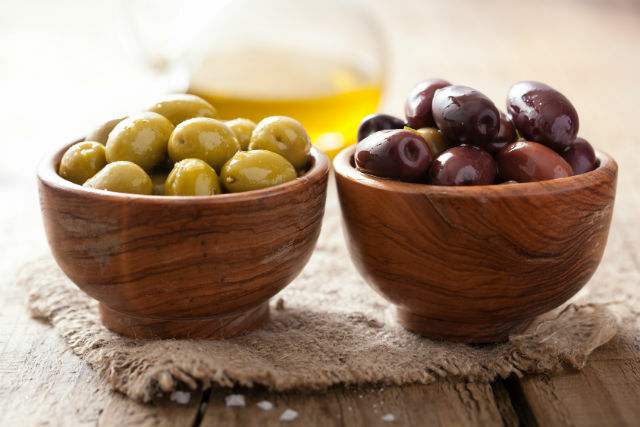 While olives come in a variety of flavors, textures and tastes, many share similar characteristics when it come to nutritional content and health benefits. Olives belong to a category of fruits called drupes. Drupes all contain a pit in the center and include cherries, mangoes, peaches, plums, almonds and pistachios. Unlike sweet peaches and tart cherries, olives are not eaten directly picked from the tree, as they are far too bitter. Depending on the variety and native region of cultivation along with the desired texture, taste and color, olives can be picked either ripened or unripened before they go through one of three possible curing methods: water, lye or brine. The color of the olive has little to do with its ripeness. Some green varieties are fully ripened while others turn from green to black during the ripening process. Yet others are black right from the beginning. The curing process can affect the color, as does oxidation. Typically in the United States, the five main cultivated varieties include Manzanillo, Servillano, Mission, Ascolano and Barouni. American olives are generally grown in California, picked unripened, lye-cured and exposed to oxygen. The oxidation is what changes their color from green to black. In terms of nutrition, olives of all varieties can truly be considered superfoods. Research has linked the abundance of antioxidants in olives to the overall health enjoyed by the people of southern Europe. Olives have also been linked to numerous anti-cancer benefits. Other studies have linked these uniquely flavorful fruits and their oil with a decreased risk for developing cardiovascular disease, stroke and diabetes. Furthermore, consumption of olives has been been found to help protect against oxidative stress, LDL oxidation and thrombosis. Hydroxytyrosol is a well-studied phytonutrient found in all olive varieties. An important player in cancer-prevention, researchers are now finding that it may also help prevent bone loss. Increased calcium deposits in the bone along with decreased bone loss in lab animals has been documented after increased consumption of both hydroxytyrosol and oleuropein, another important phytonutrient present in abundance in olives. These findings are probably why the olive-rich Mediterranean diet is often linked with reduced instances of osteoporosis. While known for their high healthy fat content, olives are a powerhouse of phenols, flavonoids, hydroxycinnamic acids, anthocyanins and numerous other immune-boosting compounds. And while not every variety is identical in its phytonutrient content, each one boasts a pretty impressive lineup. The main way in which olives differ nutritionally stems from their curing process. Water-curing involves simply soaking olives in water for a period of several weeks. Water-cured olives boast higher levels of certain antioxidants, yet retain a more bitter taste. Brine-curing involves soaking the olives in a concentrated salt solution for a period of several months, during which time fermentation also takes place. Greek and Spanish-style olives tend to utilize this technique, resulting in a less-bitter olive, but depending on how long the olives are soaked and the degree of fermentation, the phytonutrient composition can be altered. Lye-curing is a five-step process that incorporates soaking the fruit several times in a strong alkali solution. Dark olives are generally lye-cured, as oxygen gas is incorporated in the final stage to help the entire olive, pit and all, turn from green to black. Kalamata olives are the only variety that enjoys special status among all others. These dark purple olives are granted Protected Geographical Status and Protected Designation of Origin recognition. True Kalamata olives are grown on Kalamata olive trees found only in Southern Greece. Kalamata-style or Kalamata-type olives can be marketed, but these are not considered true Kalamatas. Regardless of the color, size, shape or brining process, olives provide a wealth of nutrition unmatched by other fruits. Incorporate these salty bites into dips, salads, sandwiches, pizzas, pastas and sauces, or just snack on them straight from the jar for an unrivaled, potent nutritional punch. P.S. I checked my jar of the Kalamata olives and I'm happy to say it is a product of GREECE.. imported from Greece..the ingredients are 'kalamata olives,spring water, sea salt,red wine vinegar, extra virgen olive oil.. The brand name is 'Pilaros', they are harvested in the Kalamata region of Greece. I buy the 1.7lb jar at Costco, for under $10.00.. Enjoy !! "Prove all things, hold fast to that which is true". Bible, on truth. Interesting article...and I do like olives...so guess I should start eating more of them.